A&R Estate Buyers is paying top dollar for Coins, Bullion and Currency! 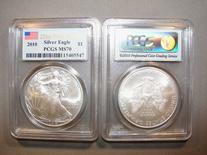 Our specialty is buying high-grade and collectible coins in gold, silver or platinum. We also trade in bullion and bulk silver coin as well. No collection is to big or small for us to examine. We recently found a $1350.00 coin in a shoe box containing junk coins and costume jewelry. Needless to say, our first-time customer was extremely delighted. With 30+ years of collecting and practical experience, our Expert Graduate Gemologist, G.I.A. will be happy to examine your coins, bullion and currency and make you our highest offer. We are members of the most trusted NGC Collectors Society.